8x8 Photo Book only $7.99 Shipped ($30 value) + 50 Free Photo Prints! 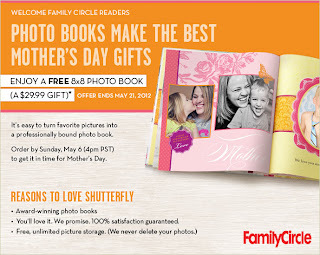 From now until May 21, you can get an 8x8 photo book from Shutterfly for only $7.99 shipped. These regularly cost $30 and would make an awesome Mother's Day gift! The book is free, all you have to pay is the shipping. Even better, you'll also score 50 free photo prints!